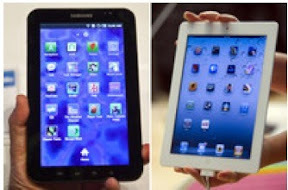 Apple Inc. (AAPL) sued Samsung Electronics Co. alleging that the electronics maker’s Galaxy phones and tablet computers infringe patents and the trademarked look of the iPhone and iPad. Samsung is infringing patents related to the way the Galaxy devices operate, including the use of hand gestures on the screen, as well as patents on the color and rectangular shape of the iPhone and iPad, Apple said in a complaint filed April 15 in federal court in Oakland, California. The Galaxy phones and tablet, which use Google Inc. (GOOG)’s Android software, were specifically designed to copy Apple products, Apple said. 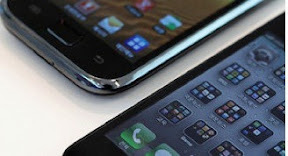 A Samsung Electronics Co. Galaxy S smartphone, top, and an Apple Inc. iPhone 4 are arranged for a photograph at an electronics store in Seoul, South Korea, on Tuesday, April 19, 2011. Steve Dowling, a spokesman for Cupertino, California-based Apple, said the company needed to protect its intellectual property. Samsung shares dropped 0.7 percent to 861,000 won at 12:44 p.m. in Seoul trading, poised for a fourth consecutive day of decline. The shares have tumbled 9.4 percent this year compared with a 2.9 percent gain for Apple on the Nasdaq Stock Market. Apple and Google are competing for supremacy in the growing market for smartphones and tablets. Google’s Android operating system -- used by Samsung, Motorola Mobility Holdings Inc. and other companies -- will account for 39.5 percent of global smartphone shipments this year, compared with 15.7 percent for Apple, according to market research firm IDC. The iPad dominates the tablet market, accounting for about two-thirds of sales this year, according to Gartner Inc.
“Apple is going to be very aggressive in protecting intellectual property and the fact that they may be a supplier doesn’t factor in to a decision to go after any competitor that they may think violates its intellectual property,” said Tim Bajarin, president of Creative Strategies Inc., a technology consulting firm in Campbell, California. Apple claims Samsung is infringing seven patents related to the way the devices understand user gestures, including selecting, scrolling, pinching and zooming, according to the complaint, and three patents on the design, including the flat black face of the iPhone and iPad. Samsung also is accused of copying the on-screen icons, as well as trademarks for certain icons, including green boxes with phones or a sunflower for photos. Apple also claims the packaging is copied. “Instead of pursuing independent product development, Samsung has chosen to slavishly copy Apple’s innovative technology, distinctive user interfaces, and elegant and distinctive product and packaging design, in violation of Apple’s valuable intellectual property rights,” Apple said in the complaint. The case is the latest legal dispute between technology companies over the growing market for smartphones. Apple is involved in a patent fight with Motorola Mobility Holdings, as is Microsoft Corp.
Apple lawyers are also arguing before a federal trade panel in Washington that another Android user, HTC Corp. (2498), is infringing other patents. The case is Apple Inc. v. Samsung Electronics Co., 11-cv- 01846, U.S. District Court, Northern District of California (Oakland).